Leonardo’s innovative and highly expressive Last Supper of c.1495-98 painted high on the wall of the refectory of Santa Maria delle Grazie, Milan, made a huge impact on other artists. The Last Supper, attributed to a close Milanese follower of Leonardo, Giampietrino (active c.1495-1549), is a remarkable and intriguing early version on canvas of Leonardo’s composition. It is on loan from the Royal Academy to Magdalen College, where it appropriately hangs in the ante-chapel in a late 15th-century setting. The exhibition is part of a larger itinerary around Oxford, entitled Leonardo and Oxford: Discovering the World of Leonardo in Oxford’s collections. 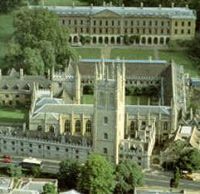 Other Oxford museums participating in the itinerary are Christ Church Picture Gallery, The Ashmolean Museum, The Museum of the History of Science and The University of Oxford Botanic Garden.